Is the holiday season really complete without a good gingerbread cookie recipe? Baking gingerbread cookies fills the house will that distinctive sweet and spicy aroma that brings everyone to the kitchen waiting for the cookies to come out of the oven. Mix the brown sugar, shortening, molasses and water in a large bowl. Stir in the remaining ingredients. Cover and refrigerate at least 2 hours. Grease a cookie sheet lightly with shortening. Roll the dough 1/4 inch thick on a floured surface. Cut with a floured gingerbread cutter or other shaped cutter. Place 2 inches apart on the cookie sheet. Bake for 10-12 minutes or until no indentation remains when touched. Remove from the cookie sheet. Cool completely on a wire rack. Decorate with colored frosting, colored sugar and candies if desired. Makes at least 2 1/2 dozen 2 1/2" cookies. The dough will be quite thick and after being refrigerated will roll out nicely. Ginger bread cookies are traditionally thought of as Christmas cookies, but you can certainly bake them any time of year. The nice thing about these cookies is that they aren’t overly sweet. This recipe comes out crisp and spicy with enough sweetness to enjoy them as a cookie. Decorate as you like. It’s a great holiday treat for kids. They’ll love putting their own stamp on these wonderful holiday cookies. As you can see from the images above, gingerbread cookies can be elegant or fun. Your choice. 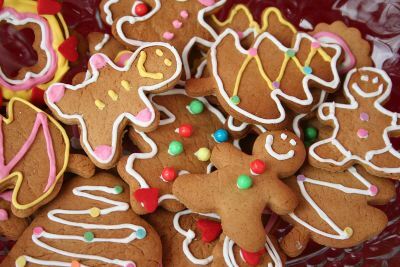 Ginger bread cookies make a great Christmas gift. Just cut the dough into your favorite shapes with cookie cutters before baking. When they are baked and cooled, wrap several cookies, iced or plain with clear cellophane and tie with a beautiful bow. Freshly made cookies are usually a very welcome hostess gift wherever you are invited. 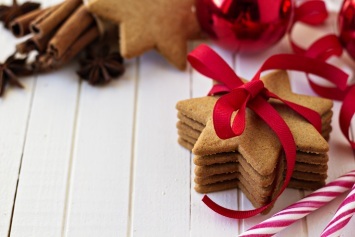 This delectable gingerbread cookie recipe is just one of our cookie treats. Find all of our cookie recipes here.